special organic umeboshi plums from Oroville, California. Umeboshi plums are traditional Japanese pickles used in morning porridge, sushi, rice balls, salad dressings, beverages and more. Pickled with red shiso (beefsteak) leaves and sea salt, these plums taste tart and sour. Umeboshi plums are a super alkaline food for maintaining balance and aiding the digestive process. 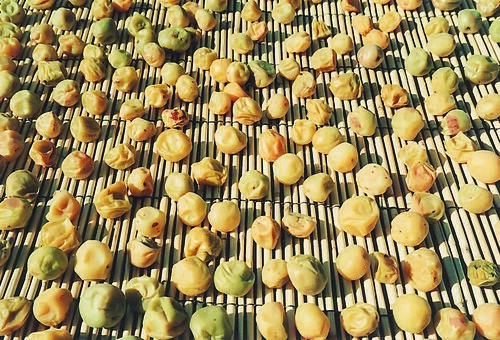 They made their umeboshi plums in the truly traditional way, as they grew the ume trees organically, picked the plums by hand, and sun dried them for three days under California’s long hours of sunshine. While sun drying they have to be turned frequently. I remember when I went to help them I learned to continuously turn each ume plum for hours so they wouldn’t get burned and stick to the bamboo matt. They have only used selected choice sea salt and their home-grown red shiso leaves to make their premium hand-made umeboshi plums for many years. Jyunsei passed in 2000 and Kazuko kept up the work by herself, but she eventually retired in 2008. Since Jyusei passed, she was not able to promote her umoboshi plums widely. Settled in a retirement home, Kazuko still has umeboshi plums for sale, so we decided not only to help her, but to seize this opportunity to spread the love and care with which she and Jyusei prepared these umeboshi plums. 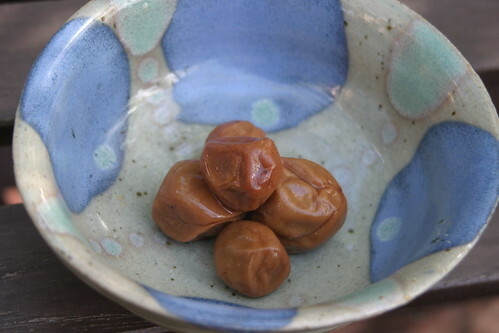 The umeboshi plums that we received from Kazuko are made in 2003~2005. Umeboshi plums are like wine; aged ones are rich in enzymes and have a naturally sour delicious flavor. Most companies limit their production to a yearly basis, while others use preservatives. So this is the rare occasion to find such aged umeboshi plums. 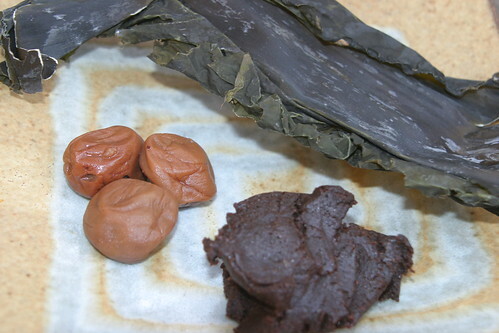 An umeboshi story: There is “God” in the umeboshi plum! child. Perhaps my destiny in the universe was sealed right then and there — to follow the macrobiotic way. Usually none organic umeboshi plums are sold at $15~16 for 7 oz.at a natural market. We are selling Kazuko’s umeboshi plums at a special price of $15 for 8 oz or $30 for 16 oz(1 lb). Please come and purchase some before they are gone!!! 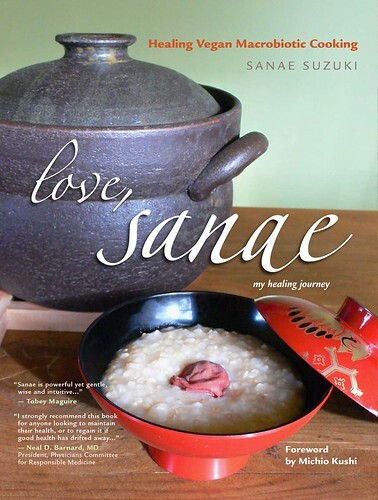 Here are two easy a umeboshi plum recipes from "Love, Sanae" healing vegan macrobiotic cookbook. You see the cover is brown rice congee (porridge) with Umeboshi Plum!!! the sourness of the umeboshi helps stimulate my appetite. 1. Place the umeboshi in a tea cup. 2. Pour in hot tea and stir well. Drink while hot and eat the plum. The combination of umeboshi and Kukicha (twig tea) is good for strengthening the blood and circulation through regulation of digestion. 1. In a suribachi, combine the umeboshi paste and water until well blended. 2. Serve with Boiled Salad or other vegetables. or just eat with your whole grains!!! Soooo shocked to find out that Quake and Tsunami happened in Japan last Fri. March 11. Now Potential Nuclear Disaster as Radiation. To help protect against radiation, people in danger of contamination should eat 1 or 2 bowls of miso soup every day, prepared with kombu seaweed and root vegetables and 2-3 year aged unpasteurized barley miso. They should also consume brown rice, millet, and other whole grains prepared in whole form, Hokkaido pumpkin and other round or root vegetables, small amounts of seaweed cooked in other styles, shoyu(soy sauce) broth, umeboshi plums, gomashio and other condiments. It is best to avoid or reduce oil, raw food, animal food (including meat, poultry, eggs, dairy, and fish), fatty food, fruit, nuts, stimulants, and alcohol until the danger is past. If there is no facility to cook, just eat umeboshi plums, mix miso in drinking water or eat nori sea vegetables will help. My recommendation is just chew, chew, and chew well with your prayers!!! This approach should be more effective than simply taking iodine pills, but the iodine pills are recommended for temporary emergency use until such time as they are able to obtain miso and cook. If you want help, please pray for people in Japan from your heart!!! And please donate even a small amount.